The Christian Education Ministry provides consistent and dynamic Life Style & Leadership Training held quarterly, a weekly Power Hour Bible Study on Wednesday nights and ministry educational opportunities throughout the year. Anyone who wants to grow in Christ, can grow in Christ at FHG1 Ministries. This series is designed to grow and raise up dynamic leaders in the church, the community and in the business sector. It teaches the born again believer how to operate in excellence while building Godly character, walking in the Word of God daily and enhancing your life and the lives of others. This weekly class consist of one power-packed hour of intensive Bible Study that takes you through the Bible in a systematic way. As you open up the Word of God from Genesis to the Book of Revelations, this class is designed to help you rightly divide the Word of God and apply it in your life. You will be amazed at how quickly you will mature and grow in the Word of God as you learn and you are challenged to be Doers of the Word and Not Hearers Only. Minister Michaels’ time, energy and personal study time is evident, as he delivers the Word of God with power and in a very down to earth simple and loving way. In our Power Hour Bible Study, active participation in the class is welcomed and Minister Michael encourages feedback and questions. You will be enlightened and blessed in the Word of God as you learn to consistently study the Bible for yourself, and put God first. 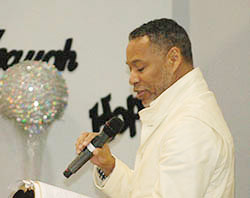 Come join Minister Michael each Wednesday night from 7:00 PM to 8:00 PM in the sanctuary of FHG1. You will not be disappointed.